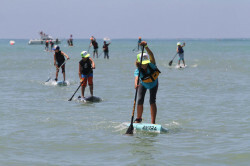 Earlier today a small but classy field of paddlers descended on one of SUP racing’s traditional homes, Doheny State Beach in Dana Point, California. The 2014 Hobie Hennessey’s Waterman’s Challenge was a two-race event, combining a 5 miler with an elite surf race to crown the overall winners. So after combining results from the two disciplines, Anthony Vela and Candice Appleby came out on top. There were also solid performances from the likes of Brandi Baksic, Team USA star Shae Foudy, Sean Pangelinan and Ryan Murphy (edit: and Brennan Rose/Javier Jimenez). However from all reports the highlight was the kids’ racing, where a bunch of very enthusiastic groms blazed around the course in a showcase of SUP racing’s future. 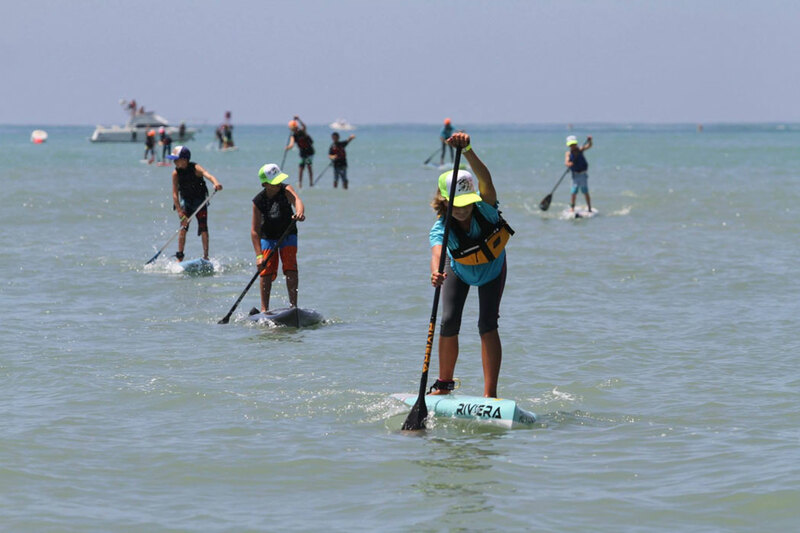 The Paddle Acacemy’s GromChallenge race actually came close to drawing the biggest field of the day, with 29 boys and girls making it look easy and reminding us older paddlers that our time is almost through. Oh and I also saw a few cool pics of Mexico’s rising star, Javier “Bicho” Jimenez and Brennan Rose near the pointy end of the men’s surf race, however they’re not in the results… not sure why. UPDATE: Seems like Bicho and Brennan were leading the 5 miler but took the wrong course and were DQ’d. They still raced in the surf race and finished 1-2 there as well, however they weren’t in contention for the overall results you see below. But DQ or not, these guys have been in fine form lately, particularly Bicho… Now that everyone knows Titouan Puyo’s name, perhaps Javier Jimenez will take over his role as “World’s #1 Dark Horse”? Anyway there’s a whole stack of really good photos up on Facebook thanks to Riviera’s Mike Muir. Not sure if the overall results were based on combined times or combined points (coz AV and Candice would have either way), but anyway here are the results from each race. Click on “5 Miler” or “Surf Race” to show results from each race, or click “Combined” to see who had the fastest overall times. 2 Tyler Bashor 0:45:54 Guy SUP 12'6"
4 John Andel 0:46:51 Guy SUP 12'6"
6 Lexi Alston 0:49:50 Girl SUP 12'6"
7 Cameron Fraser 0:50:12 Guy SUP 12'6"
9 Kristin Kaczmarek 0:51:18 Girl SUP 12'6"
11 John Nordin 0:52:18 Guy SUP 12'6"
12 Susie Hopper 0:52:30 Girl SUP 12'6"
13 Alley Miesch-nie 0:53:12 Girl SUP 12'6"
16 Gretchen Benedetto 0:55:04 Girl SUP 12'6"
17 Jim Wolfe 0:56:42 Guy SUP 12'6"
19 Kennady Rose 0:59:27 Girl SUP 12'6"
22 Michelle Brislen 1:05:31 Girl SUP 12'6"
24 Kennedy Underwood 1:06:09 Girl SUP 12'6"